Has your car's heater seen more efficient days? Stay warm on those cool drives in a VWCA sweatshirt! 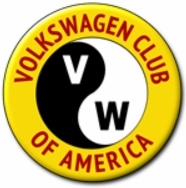 Beetle logo appears across the back, small classic VWCA logo on the front. Available in black or gray.